A double-century opening stand between Dhananjaya Lakshan and Hasitha Boyagoda seemed to have settled the game for Sri Lanka until the remarkable collapse. CHRISTCHURCH, Sunday : Something must have been in the Gatorade. It's the only explanation for what happened following the final drinks break of the day, when Sri Lanka almost lost the unlosable, only to finally reach victory in the last over in the ICC Under 19 Cricket World Cup Plate final played at the Bert Sutcliffe Oval, Christchurch on unday. If the water bottles were tampered with, there was something in the mix for both teams. Both were responsible for the fluctuation, Sri Lanka inexplicably panicking, and West Indies finding their mislaid spirit. At the stoppage, Sri Lanka were 203/0, needing 52 from 84 balls. Hasitha Boyagoda had passed his hundred, Dhananjaya Lakshan was nearing one of his own, and the result seemed a formality. And then it happened. Boyagoda spooned to Jarion Hoyte to Nyeem Young at mid off. Nishan Madushka was run out, then Jehan Daniel, and then Lakshan, trying to reach his hundred with a boundary and relieve some pressure, was caught at mid off as well. 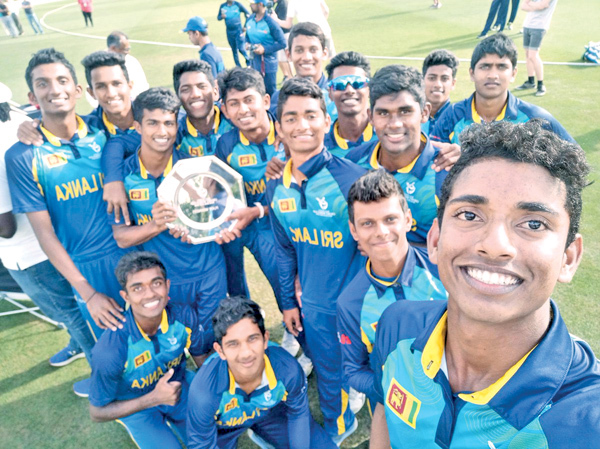 Sri Lanka under 19 cricketers rejoice winning the Plate final against West Indies. All of a sudden a stroll had turned into a contest, and it was only made closer when Bhaskar Yadram bowled a double wicket maiden, removing Kamindu Mendis and Ashen Bandara. Runs were coming, but slowly, and the game tightened again when with six to win, Nawanidu Fernando tried to finish it in one blow and was well caught on the boundary. A chipped four to end the 49th over left Sri Lanka one to win, and seemed to have settled the matter. Three dot balls to start the 50th unsettled it. And then a rushed single, and jubilant celebrations, and the inevitable result finally transpired. The finish is why the game will be remembered, but it was set up by a trio of special performances that deserve not to be forgotten in the maelstrom. Hasitha Boyagoda was exceptional, once again, playing an innings that was at least the equal of his record breaking 191 against Kenya. Scoring all round the ground, with an array of sweeps and scoops allowing him to find space behind the wicket, he seemed entirely at ease until he was dismissed. He must have thought with the game won he had licence. He couldn't have known. And he was ably supported by Dhananjaya Lakshan, who almost joined him on two hundreds for the tournament, rotating the strike and allowing his more aggressive partner to have his way, while also chipping in himself with 12 fours and a six. Then there was Alick Athanaze’s wonderful unbeaten hundred, his second of the tournament, which held the West Indies innings together. Sri Lankan captain Kamindu Mendis won the toss and chose to bowl, and might have initially been regretting his decision as West Indies’ openers added 50 within seven overs. Bhaskar Yadram was particularly severe, taking five early boundaries, and though all were struck firmly, each was kept along the ground, and it was only when he tried to take the aerial route that his downfall came, picking out Ashen Bandara at mid on. His dismissal initiated a slide of 10/3 as Sri Lanka turned the screws, especially through slow bowler Praveen Jayawickrama, who claimed the wickets of Yadram and Kimani Melius on his way to figures of 2/33. But West Indies recovered through Alick Athanaze who played the situation to perfection, realising that a counter-attack wasn’t on and instead nudging singles and rotating the strike, doing so regularly enough to ensure his strike rate didn’t suffer. He received stodgy support from Kirstan Kallicharan and Emmanuel Stewart and Brad Barnes, though all three struggled to score freely, tied down by accurate bowling and energetic fielding, and bothe were dismissed by excellent catches. Even towards the end Athanaze was still struggling to find the boundary, and his innings contained just seven in total, making the fact that he finished scoring at a run a ball all the more remarkable. There have been more eye-catching innings, quicker innings, bigger innings at the ICC U19 CWC, but this was one of the most impressive of the lot, a batsman reining himself in against disciplined bowling, on a tricky pitch, and dragging his side to a total that seemed decent at the break, and then wholly inadequate when Boyagoda and Lakshan were batting. In the end, it wasn't quite enough.